Push-on is a textile reinforced hose designed for low pressure hydraulic and pneumatic systems, such as robotics, shop air systems, and automotive applications. 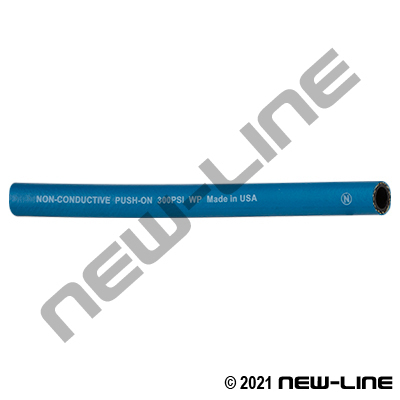 Push-on is used for quick field assembly, repairs, or installation where no assembly equipment is provided (all Push-on is maximum 250-300psi). It has an oil resistant tube which will handle air, water, lubricating oils, antifreeze, and mild resistance to gasoline (typically not recommended for gasoline). The standard colour is Black (NL505) or Grey (NL506), and we also offer blue (NL509), yellow (NL507), or red (NL508) for colour coding purposes. Our NL515 Black push-on is made of higher grade rubber compounds as compared to standard push-on hoses seen on the market and is MSHA approved for mining applications, as is NL506 and NL509 Series. Insta-Grip is non-conductive with a minimum electrical resistance greater than 1 megohm per inch of hose length at 1000 volts DC. Typical Fittings: Brass or stainless "Push-On fittings" which are specifically designed for use on "Push-On" hoses up to 300 psi (do not use on any other type of hose). When used with Push-On hose, the defined barb on the fitting and the special hose reinforcement will provide sufficient grip thereby eliminating the need for any hose clamps. Construction: Tube: Black Chemivic rubber blend. Cover: Chemivic rubber blend. Reinforcement: Spiraled synthetic yarn (specially angled for push-on fittings). Temperature Range: -40°C (-40°F) to +88°C (190°F); higher temperatures for hydraulic fluid (not air) available in the NL515H- series up to 300°F. Also see our high quality Aeroquip FC332 AQP push-on for high temp air or hydraulic fluids.